What price do you pay for taking water? We understand and share public concerns about access to water, and are fully committed to the long-term social, economic and environmental sustainability of the areas where we bottle water. Nestlé Pakistan has been paying applicable charges and taxes for withdrawing water in the past and will continue in accordance with court orders. We respect and support balanced regulation on the withdrawal of water. This includes equitable rules on the amounts all water users should pay to ensure the long-term sustainable management of watersheds. Is Nestlé responsible for the lowering of groundwater levels in Pakistan? We are committed to ensuring that our operations do not deplete water resources wherever we operate and are working on ways to improve water availability for local communities around the world. Two of our sites (Sheikhupura and Islamabad) are AWS Certified. It is an international standard that helps to acquire best practices and work transparently with other local stakeholders to sustainably manage shared water resources. What is Nestlé doing about climate change? 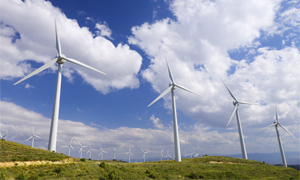 CLEAN AND RENEWABLE: Nestlé Mexico is obtaining 85% of its electrical energy needs from wind power. a)	Are you reducing your greenhouse gas emissions? Yes. Over the past ten years we’ve halved the greenhouse gas (GHG) emissions from our factories per kilo of product. We are committed to lowering the GHG emissions associated with the production and distribution of our food and beverages, by improving energy efficiency, using cleaner fuels and investing in renewable sources. For example: switching from long-distance road transportation to rail or short-sea shipping in Europe, opting for wind power to supply energy to our factories in Mexico, and installing wood-fired boilers at some of our factories in France. b)	How does your performance compare to other companies? We are one of the leaders in the areas of climate change mitigation and adaptation. Our practices for cutting GHGs, and disclosing our activities in this area, have been consistently recognized as among the best in the industry. In 2013 and 2012 we achieved the maximum score in the CDP ‘Climate Disclosure Leadership Index’ and the CDP ‘Climate Performance Leadership Index’, both of which are published in the Global 500 Climate Change Report 2013 (pdf,1.48Mb). The CDP indices measure the performance of the top 500 companies in the FTSE Global Equity Index in terms of their efforts to cut carbon emissions, as well as the transparency of the information they disclose. In 2013 we were the leading food products company in the Dow Jones Sustainability Index for the first time with a score of 88%, double the industry average. Our strong policies and transparent reporting in the area of environmental sustainability - including our climate change mitigation activities - led to us achieving 97% in the ‘environment dimension’ of the Dow Jones Sustainability Index - the best score in the industry. The Oxfam 'Behind the Brands scorecard' , which assesses 10 food and beverage companies on their policies and commitments to improve food security and sustainability, continues to rank Nestlé first on climate change. c)	What else is Nestlé doing to mitigate climate change? We have pledged that our products will not be associated with deforestation. This pledge covers all of the raw materials we use to make our products, as well as packaging. As well as committing to lowering the greenhouse gas (GHG) emissions associated with the production and distribution of our products, we commit to designing products that help consumers lower their own GHG emissions, and we work with farmers to improve their resilience to climate change. You can find out more about our efforts here. For example, in Europe we have pledged to systematically introduce more environmentally efficient ice cream freezers. From now on all new commercial horizontal ice cream chest freezers we buy across the continent will use only natural refrigerants. These are naturally occurring substances that do not harm the ozone layer and have no or negligible global warming effects. And our work to help cocoa and coffee farmers adapt to environmental challenges has been recognized as an example of best practice by the United Nations’ Framework Convention on Climate Change (UNFCCC). d)	What are your targets for the future? In 2013 we committed to reducing our direct, GHG emissions per kilo of product by more than a third again by 2015, compared to 2005 levels. For more information on our climate change mitigation and adaptation commitments, please take a look at our Nestlé Commitment on Climate Change. What is Nestlé doing about deforestation? 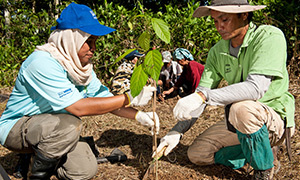 PROTECTING ECOSYSTEMS: Nestlé employees and seedling planters working on a reforestation project in Malaysia. In 2010, we made a commitment on no-deforestation (pdf, 28Kb), which states that our products will not be associated with deforestation. This commitment covers all the raw materials we use to make our products and packaging. We have developed accompanying category-specific requirements set out in the Nestlé Responsible Sourcing Guideline (pdf, 2Mb). We are mapping our supply chain of key raw materials back to their origin and we assess and develop our suppliers against these guidelines. We have an ongoing partnership with global non-profit organisation The Forest Trust to ensure the responsible sourcing of palm oil and pulp and paper. As a member of the Consumer Goods Forum, we also support its commitment to help achieve zero-net deforestation by 2020. In 2013, in partnership with the non-governmental organisation Conservation International, we developed guides to track and illustrate areas at greatest risk of deforestation. In 2014, we joined a number of companies to support Global Forest Watch (GFW), an online transparent mapping application providing data about what is happening in forests worldwide. GFW is intended for use by stakeholders who seek to better manage the world’s forests and improve local livelihoods. Where possible we use mono-material packaging such as cardboard and paper (used in cereal boxes), glass (used in Nescafé jars), aluminum or steel (used in canned food) and PET (polyethylene terephthalate) which are all recyclable. We also encourage the development of packaging recycling schemes by local authorities and other stakeholders. We also use recycled paper, cardboard, PET, glass or tin plate for our packaging where appropriate. In 2011 we reduced our packaging by 39 000 tons as a result of our source optimization programme. What is Nestlé doing to reduce its water footprint? We have a multi-pronged approach when it comes to saving water, which we have brought under one umbrella and call it the Caring For Water initiative. We have programs that target in-house efficiencies, the Agricultural Supply Chain and the Communities. As part of our In-house initiatives, our programs have enabled us to reduce water consumption per ton of product by 11% between 2013 and 2017. Two of our factories (Sheikhupura and Islamabad) are certified for the Alliance for Water Stewardship (AWS) Standard. It is an international standard that provides a framework for companies to take steps inside the factory but also outside by collaborating with other local stakeholders to protect shared water resources. Nestlé Pakistan also has partnerships with the Punjab government’s Agriculture Department, Pakistan Agriculture Research Centre and University of Veterinary and Animal Sciences to promote drip irrigation, which will help us save at least 400 million litres of water by the end of 2019. We also promote Dry Seeded Rice, Furrow irrigation, hose reels and water efficient fodder varieties through our partnership with Department of Agriculture (Punjab Government). We have also developed affordable smart soil sensors in collaboration with Lahore University Management Science’s Centre for Water Informatics and Technology. We also have a partnership with Sustainable Development and Policy Institute (a think tank) for research based advocacy. We have 6 Clean and Safe Drinking Water facilities in our areas of operation and provide safe and clean drinking water to more than 60,000 people every day. What is Nestlé doing to help ensure the welfare of farm animals in your supply chain? We share consumers’ concerns about the welfare of farm animals and we are committed to ensuring the highest possible levels of farm animal welfare across our global supply chain. In 2012, we established our Commitment on Farm Animal Welfare (pdf, 2Mb), which is based on the World Organization for Animal Health (OIE) guidelines. This commitment, which was updated in 2014, serves as the basis of our responsible sourcing requirements on meat, poultry, eggs, and dairy products, which form part of our Responsible Sourcing Guideline (pdf, 2Mb). We are also the first major food company to enter into a global partnership with an international animal welfare NGO, World Animal Protection. Together with World Animal Protection and our supply chain partners, we are working to further improve farm animal welfare in our supply chain by ensuring compliance with our RSG. What specific activities have you undertaken so far? In November 2013, we began farm-level assessments of animal welfare practices in our supply chain using our Responsible Sourcing Guideline assessment protocol, which we have developed with the expertise of World Animal Protection. In early 2014, we began implementing our responsible sourcing requirements on meat, poultry and eggs. We will continue to implement these requirements, along with milk and dairy, gradually across our global supply chain. With the implementation of our Responsible Sourcing Guideline on farm animal welfare, we want to help bring about positive change at every level of our extended supply chain: from our direct suppliers of animal-derived ingredients, to their own suppliers and back to the farms.